American Horror Story is one of the most talked about shows on television, and everyone is particularly excited for season five: Hotel. A few months ago it was confirmed that Lady GaGa would be starring in it, and show creator Ryan Murphy just announced that Finn Wittrock, who played Dandy last season, would be rejoining the cast. He also teased a potential love triangle between Wittrock, GaGa, and Matt Bomer. This season sure sounds like a must-see! A new era of Lana Del Rey is upon us! The singer just wrapped up her Endless Summer tour on Tuesday and shared with fans a snippet of her new song and video, “Honeymoon” on instagram. The song sounds very dreamy and romantic, and the video is very interesting, complete with palm trees and a tiger. She also posted the lyrics to the entire song. 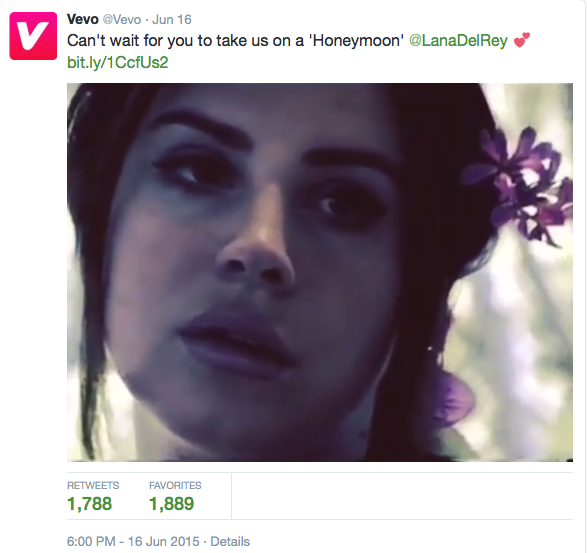 Vevo tweeted this picture from the clip, letting us know that the full video will probably be here soon! This past Sunday was the season five finale of Game of Thrones, and tons of celebrities were tweeting about it. Elizabeth Banks and Mindy Kaling shared many tweets back and forth about it, talking about their love for one of the most popular characters, Jon Snow. People were talking about the shocking and dramatic finale all week, with a lot of fans upset over how it ended. Now we have to wait almost a whole year to see what happens next. Finally, this week Fifty Shades of Grey author EL James released another book in the series. This book records the events of the series from the point of view of Christian Grey rather than the original narrator, Ana. It is simply called Grey. Anyway, last week someone managed to steal a copy of the manuscript for the book from the publishing house. It was a pretty crazy heist, especially considering they only had a week to wait for it to be released. Social media is now flooded with people making fun of how badly written the new book is. So are you excited for American Horror Story: Hotel? And how about that Game of Thrones finale?! Let us know in the comments or tweet us using #glamorouspaper!